The B&A Two (Or Three) Step. This is a wonderful product that everyone owning a toy should have in their arsenal. It's quick and easy to use! 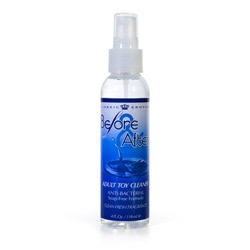 I love Before & After Adult Toy Cleaner. It is very easy to use, has a fresh, clean scent, and blends in nicely with my body sprays on my dresser. The packaging that I have is different from the picture shown here. My bottle has a blue/green sticker with splashing water on the front which, without looking closely at the writing, could look like a bottle of body splash from your favorite bath and body store. This makes it a very discreet product. The ingredients are: water, cocamidopropyl PD-dimonium chloride phosphate (that's a mouthful! ), benzyl alcohol, disodium EDTA (preservative), and fragrance. There are no glycerins or parabens, and there are no soaps or artificial colors, so this toy cleaner is body-safe and also safe to use on any toys that can get splashed. There are only two steps necessary: 1. Spray it on and 2. Wipe it off. I tend to follow with a third: Rinse it off. I generally do this just to remove any fuzzy pieces that my washcloth or paper towel might have left behind. This spray is safe for use on any material that can get wet, from silicone to the dreaded jelly, acrylic to glass, and aluminum to steel. If it can get wet, Before & After Adult Toy Cleaner can clean it. This is a great cleaner for vibes in particular. Most of my other toys can be thrown in the dishwasher or boiled, but vibes, even if they are waterproof, can be damaged by high heat. At the time I purchased this, I opted for an eight ounce bottle (which does not meet FAA/TSA carry-on standards), but it also came in a four ounce bottle (which does meet FAA/TSA standards) and individually sealed wipes. The bottles are pump sprays just like your standard body spray. Still my favorite cleaner. Very easy to use, hardly a scent, not terribly obvious on my counter. I hope it never gets discontinued. I just wish EF would carry the wipe version. I can't believe that an 8 oz bottle of toy cleaner is against TSA standards! Ugh today's societies. Thanks for the review! Well, for carry-on. I guess I should specify that!